There’s a new book on my reading list: Memoirs of a Solo Traveler – My Love Affair with Italy, by Margie Miklas. 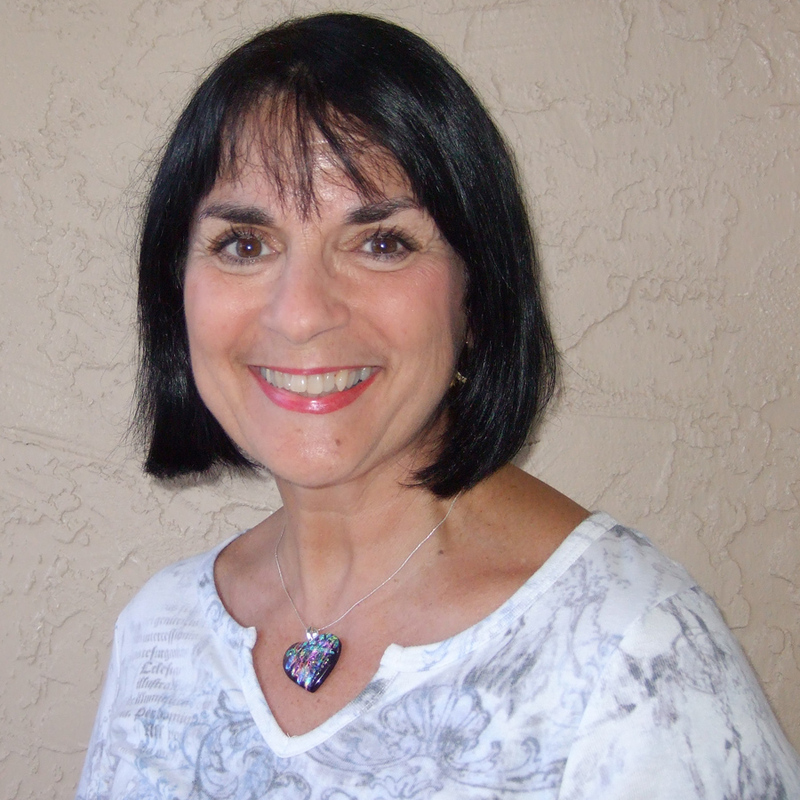 Margie is an Italian-American writer, photographer, and critical care nurse, based in Florida. Her memoir recounts her dream-come-true-3-month trip to Italy, where she visited 50 towns, from Val d’Aosta to Sicily, and also searched out her grandparent’s village, meeting long lost cousins. Brava Margie! I also recommend checking out this Italofile’s blog, Margieintaly, which features a mix of up to date Italy info and her beautiful photos, some of which she’s turned into notecards and sells in her Etsy shop. 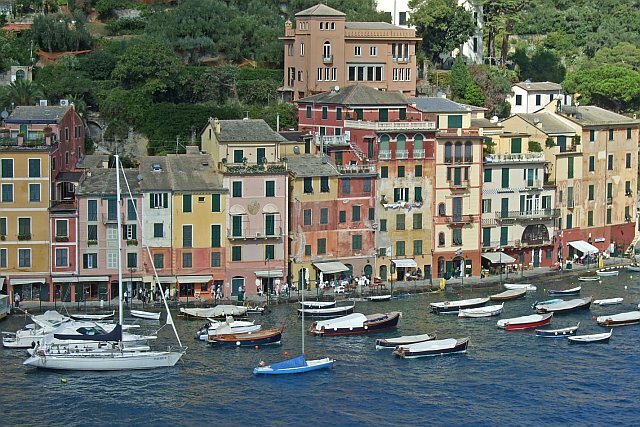 Portofino is small, a half moon shaped harbor, filled with million dollar yachts, and just under 500 permanent residents. My favorite activity is to explore this beautiful place on foot and take a walking tour. 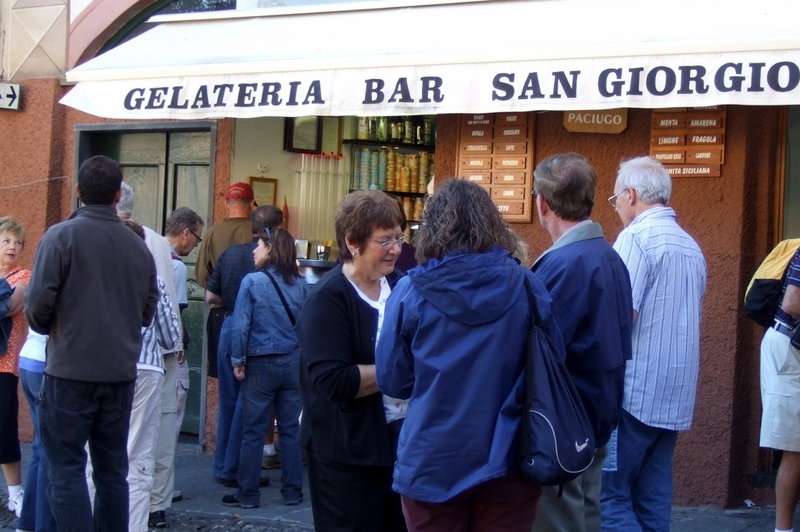 But first, stop at the Bar San Giorgio (at the harbor’s piazetta), it’s the best place in town for a caffe, gelato or prosecco–pricey but worth it for the view and ambience. From the piazzetta, after checking out all the shops, art galleries and boutiques, head uphill along the harbor and after 15 minutes you’ll arrive at St. George Church. 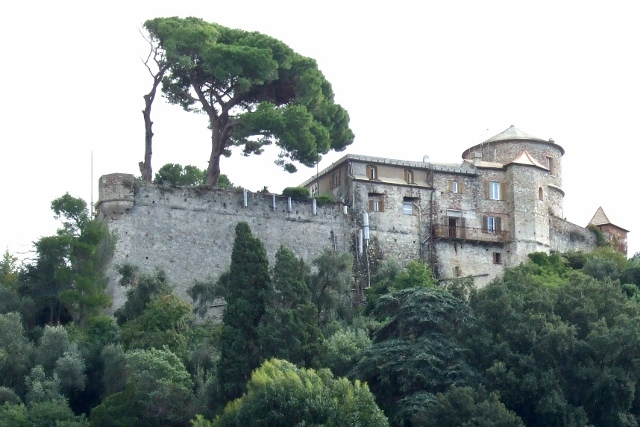 Around the right side are fantastic views of the rocky coastline and the Ligurian Sea. Ten minutes further uphill is the 14th century Castle Brown, a great place for photos. Click here for Tour Info (Open daily in summer, weekends in winter, 0185-267-101 or 0185-269-046). For lunch or dinner, one of the most highly rated restaurants is Ristorante Puny, (Piazza Martiri dell’Olivetta 5, 01 8526 9037, Reservations essential, Closed Thurs), also perfectly situated in la piazzetta. The specialties include fresh sea bass, locally caught. The waiters filet your fish in front of you at your outdoor table, and the owner, Signor Puny comes around to personally check on you. Pappardelle al Portofino (with tomatoes and pesto), is a favorite pasta dish, and the octopus and warm artichoke salad is also delicious. Or another small outdoor restaurant, on the edge of the yacht harbor, a little away from the main crowds, providing perfect views of the castle and the entire piazzetta area and the town rising into the hills, is Ristorante Magazin O, (34 Calata Marconi, 0185 269 178, Closed Mondays) also featuring fresh sea bass and pastas with seafood. The seafood antipasto is a must. Its small menu takes nothing away from the quality of the food here. The prices are high, like all the restaurants in Portofino. 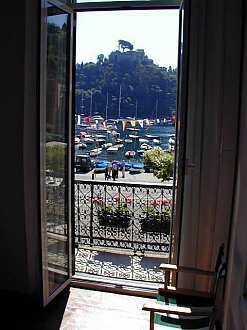 A pretty place to stay is the boutique Eight Hotel Portofino. It has 18 air-conditioned guest rooms, wi-fi, and it’s a short walk from the harbor. Prices start at 330 euros for a double room and 670 euros for a suite in the off season. 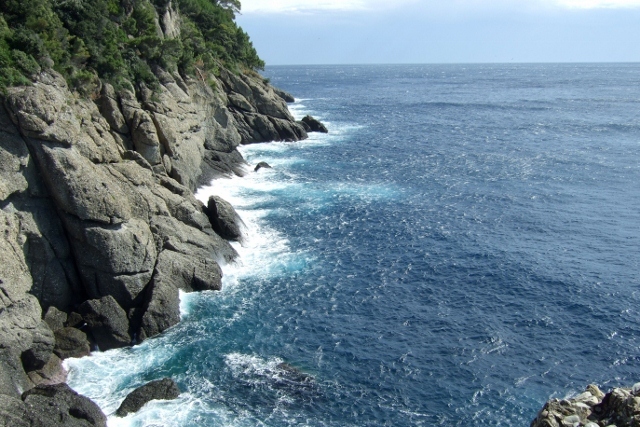 Or, stay at the Albergo Nazionale, the only waterfront hotel in Portofino, and it’s much cheaper than the nearby Splendido Mare. Prices can be as low as 100 euros a night, with rooms not facing the water. What you give up in room décor you make up for in location. 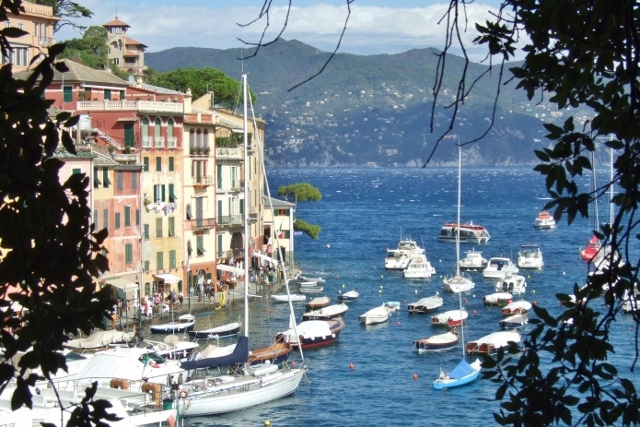 Even though Portofino is expensive, I was able to buy a few beautiful art prints at the galleries at a reasonable price. They are hanging on my wall and remind me every day of this little slice of Paradise. 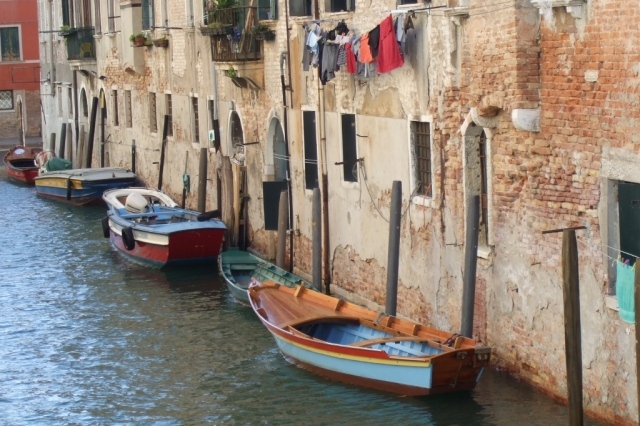 Find more info about Margie Miklas and Memoirs of a Solo Traveler–My Love Affair With Italy on her Margieinitaly blog. “Memoirs of a Solo Traveler, My Love Affair with Italy” by none other than Margie Miklas is a wonderful (and fun to read) page turner. Take the time to add this to your library of wit and wonders whether you are an arm chair traveler or one who has visited Italy. A remarkable journey and insight into the people, places and hospitality, worth your visit. In paper form, you’ll likely dog-ear pages, too. I’m so looking forward to Margie’s next book(s). Great tips and fabulous photos! Great post, Margie. Brava! I have never visited Portofino, and now you make me want to go there, although I’m not sure about the octopus and warm artichoke salad. Thank you to Susan Van Allen for offering me this opportunity to write about one of my favorite places in Italy!